FC Barcelona's last visit to Mestalla ended with a 1-1 draw with both goals coming in the first half. Watch the highlights from that match to see how tough this visit is gonna be. Barca will play their third match in the 2013-14 La Liga season tomorrow night at the Mestalla. There is no need to say that it's going to be a tough trip; Barca fans have always considered the trip to Mestalla a very tough one, especially after Guardiola took over. No other team have managed to stifle our playing style like the Valencian players have done, that too consistently. Our last five visits to Mestalla in La Liga has seen us winning once and drawing the rest of four times. But never consider those draws as boring affairs, they were the most entertaining draws one could watch and all of them had goals in it too. Our last visit to Valencia ended in a 1-1 draw, we had to thank Valdes in saving us that day with some brilliant saves. Incidentally Valdes has been saving our skin in the last couple of matches and he may have to do it again tomorrow night. For those who are a bit worried by us getting in to the Group of Death, let's look back to that brilliant performance against Milan. Barca has been drawn in to what undoubtedly could be termed as the "Group of Death" in 2013-14 UEFA Champions League Group stage. FC Barcelona has been drawn along with AC Milan, Ajax FC and Celtic in Group H in the draw. The Milan clash has become a regular even in the Europe fixture. For the last two seasons we have been playing them regularly. In the 2011-12 season we were drawn with them, that time also in Group H. Last season one of our best performances came against Milan at the Camp Nou, but then the first leg exposed all our weaknesses also. Quite a tough debut for Tata Martino! There are some interesting draw in other groups also. Another tough group is the Group F with Arsenal, Dortmund, Marseille and Napoli. Our arch-rivals are in a comparatively easy group with Juventus, Galatasaray and Copenhagen keeping them company. The other Spanish team Real Soceidad has a difficult task with Manchester United, Shaktar Donetsk and Bayer Leverkusen in their group. Atletico Madrid meanwhile is in a better proposition having to face Porto, Zenit and FC Austria Vienna. Once again it was Victor Valdes who produced the two defining moments for Barca in the 2nd Leg. FC Barcelona won their first Trophy under Tata Martino following a goal less draw against Atletico Madrid at the Camp Nou. Neymar's first leg away goal proved crucial in what turned out to be a rather tough two legged affair. Agreed, it's quite a sensational or better put a scandalous headline. But let's be honest there is a lot of truth in this headline. It's a headline which will drive Lionel Messi's detractors to ecstasy; it's also one which could trouble a Barca supporter too. Let me start by announcing to those Messi detractors, who would be rushing looking for yet another fantasy article of "How Messi is hurting his colleagues?" or "How Messi has monopolized decision making at Barca?". If you are one of those, you are at the wrong place. In fact this article has nothing to do with Lionel Messi, instead it's fullest and solely concentrated on the Spanish midfielder, Cesc Fabregas and his troubles at Barca. If you find Lionel Messi's name being mentioned so often in this article, it's purely because of the talent and the greatness of the Little Argentinian. In the end, we all are very fortunate to have one of the greatest players in the history donning the Barca colors; and it's natural that every discussion of Barca will see his name being dragged in a fair number of times. It took a rather sensational strike from Barca's Brazilian full back, Adriano to see off the threat of Malaga in Barca's first away match of the season. There was no logic for this match to have become a nervy, hard fought and gritty affair. As I wrote in my preview - Malaga vs Barca Match Preview, this was supposed to be a walk in the park for our boys. Malaga has lost most of their best players, almost all of their highest earners, almost all of those who made a difference in the previous season; but still we struggled. Looks like I was guilty of over looking a rather small fact of life; the grit and resolve of a group of players. Regardless of all their problems, they had something to prove as players with honor - that they will not simply roll down. And prove they did. In fact one had to admit that they were rather unfortunate last night, first to concede a goal in that fashion, second not to have scored the equaliser by the time whistle was blown. Recently I did start a All About FC Barcelona Facebook Fan Page in order to share a ton of videos, images and new update with all Barca fans. Had some followings by now and was looking to add some value by helping you all follow all the Barca players in Facebook. So with some work I have finally prepared the list of verified Facebook accounts of our players. Don't forget to follow them. Also follow the All About FC Barcelona fan page to get all the latest Barca Video compilations. It's not possible for me to have individual post for interesting video compilations I find on the net. For the second week running Barca will be facing a team with a new manager and one who lost almost all of their best players. Now considering the state of La Liga affairs, we should not be alarmed at this as this is the state of majority of the teams. Also as an opposition this is one hell of a good thing as most of the game will be just like walk-over. I tend to disagree with anyone who calls me arrogant and over-confident for saying that. That's simply is the fact. Malaga was one of the bright spot in La Liga's last season. But how are they supposed to stand up against us tomorrow night? Look at their losses; first they lost their manager who was responsible for their brilliant revival even with all financial issues. Then they lost all of their best players; every one of them went. I know many would only have thought that they lost Isco alone; nope they lost Joaquín, Toulalán, Demichelis, Saviola, Baptista, Lucas Piazon etc. For the record Malaga's problem were more or less their own making and the La Liga economic disparity played a very little part only; still in the end the only loser is La Liga. They seriously have to re-think the strategy of forcing clubs to become public limited companies! It's not solving the issues either; actually it's making it worse. FC Barcelona Videos from our Last visit to LA ROSALEDA. Goals from Messi, Fabregas and Thiago gave Barca a comfortable victory. 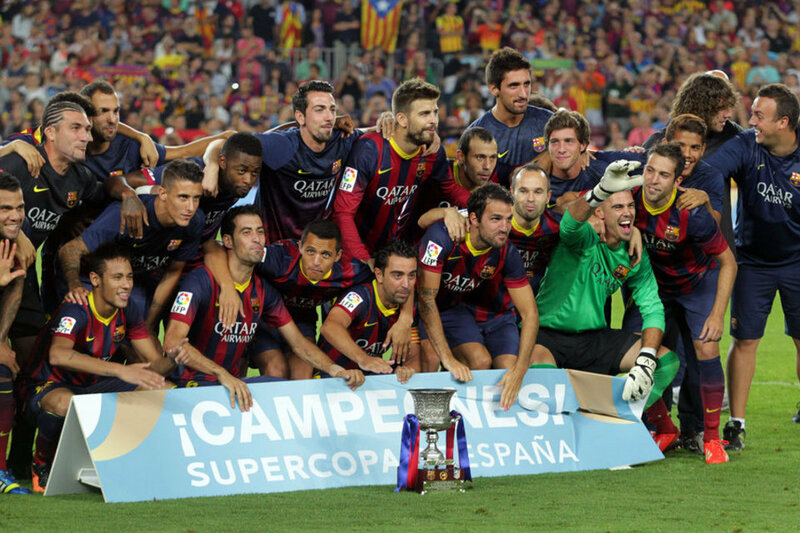 Full Match Videos of First leg of Barca's Spanish Super Cup against Atletico Madrid. 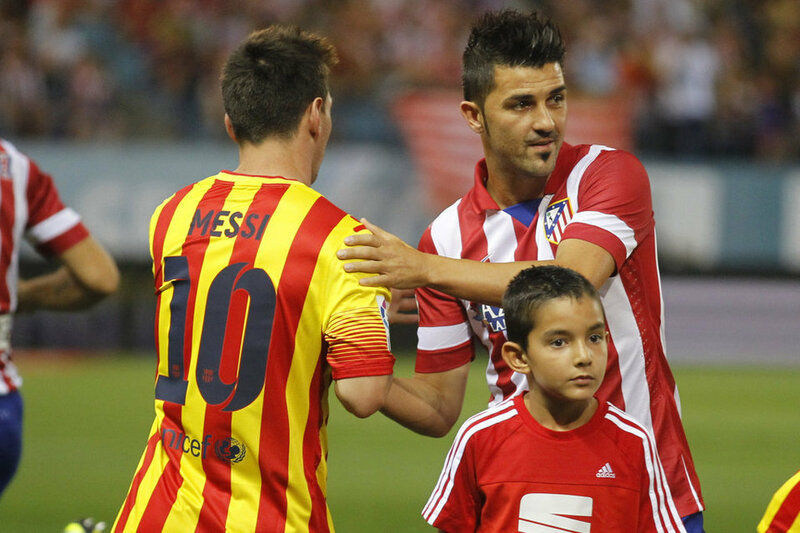 Goals from new boys David Villa and Neymar made for an exciting 1-1 draw at the Vicente Calderon. With a vital away goal we will play the second leg at home on next Wednesday. It's always fun to look back into a game where your team has demolished the opponents with no mercy. Agreed, it was a 7-0 demolition of one of the poorest of the other sides in La Liga. But still it's nice. The first half performance was something like a dream where we just terrorized the Levante defense. They didn't know what to do at times and was literally overpowered in terms of numbers at times in the box. Like my commentator said "It would be a great success for Levante if they could take the ball to the half line". But how much should we read from this performance? Some would argue that considering Levante has constantly managed to trouble us in past encounters, this performance is epic! But let's be honest, we played Levante at the worst possible time for them and the best possible time for us. They have just started playing under Joaquín Caparrós; they lost their best players in the summer and had more than two players making their debut last night. They were never ready to face us; none of that is our problem. All the Goals from Tonight's rout of Levante at the Camp Nou. 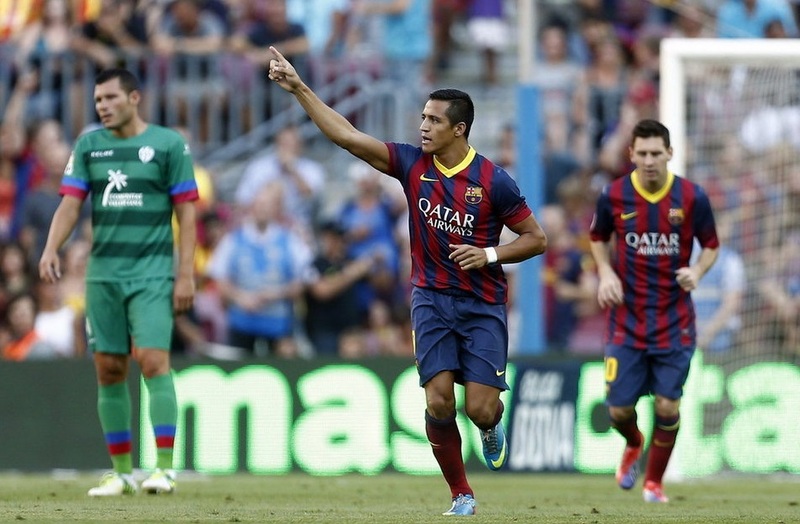 Sanchez opened the scoring followed by Messi, Pedro, cesc and Xavi all scoring. Find below the video of all the goals. FC Barcelona raced to a Six Goal lead in the first half of the match. FC Barcelona started their La Liga 2013-14 season in some style by putting seven unanswered goals past a hapless Levante side at the Camp Nou. 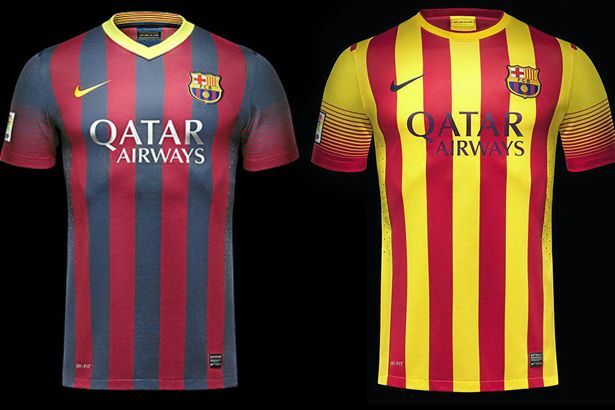 With such a huge victory Barca would be confident of defending their La Liga title this season. Five goal scorers scored seven goals for Barca and all of them saw some brilliant team play. Sanchez, Cesc, Xavi scored one each whereas Pedro and Messi scored twice in quite a show of strength at the Camp Nou turf. As expected in a first match we were not up to 100%, misplacing some passes regularly, but the relentless pressing Tata Martino has once again got back into the team saw us regaining possession almost immediately. 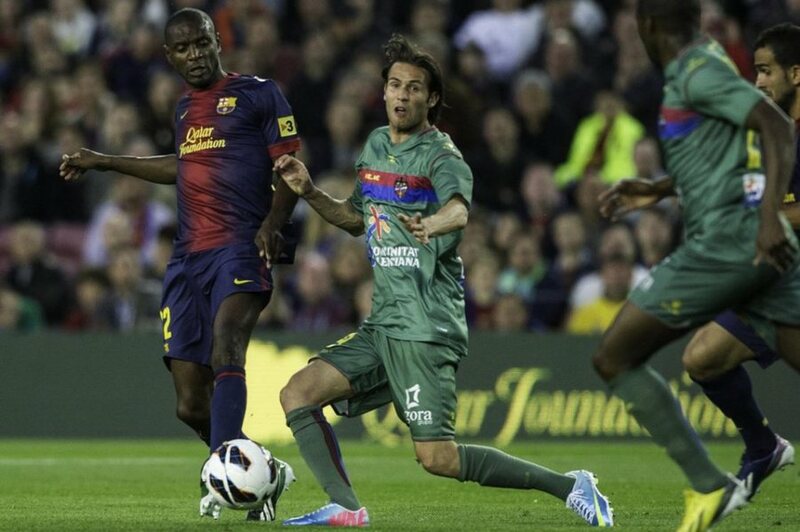 As I said in my FC Barcelona vs Levante Preview, this match was a glorious mismatch from the beginning. The line-up selected by Tata Martino was very much different from what everyone expected. 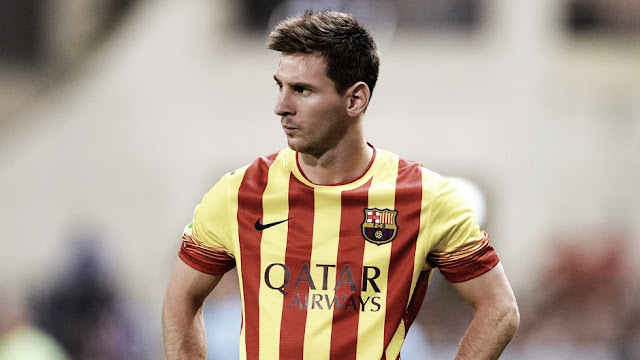 Tata Martino decided not to start with both Messi and Neymar in his debut La Liga match. Instead Sanchez, Pedro and Messi formed the front line. Even in the midfield there were some suspense with Cesc, who recovered from injury just in time making into the lineup instead of Iniesta. - Cesc, Busquets and Xavi. That decision made sense especially with Iniesta been on International duty in midweek. The defense was more or less the expected one with Puyol unavailable - Alves, Mascherano, Pique and Adriano with Valdes guarding the goal. Pinto, Bartra, Alba, Song, Iniesta, Neymar and Tello made the bench. Thanks to Dervyx3 for making this compilation. After watching this video all of us would be wondering why we let this guy leave! Strangely even after seeing him play like this our management felt he wasn't good enough. Now we are looking at the prospect of his absence hurting us really bad this season. Let's dedicate this video to the idiots who made the decision. FC Barcelona will begin its defense of La Liga crown tomorrow night at the Camp Nou against Levante, the club based in Valencia. Once again the club will be off to a hectic start, having to play five matches in the opening fifteen days. That also involves the two legged affair Super Copa affair against Atletico Madrid. The season has not yet officially began but we already is seeing some injury issues. Cesc Fabregas is more or less ruled out of the opening match because of the injury he picked up in the last match on the Asian tour. But there is a feeling he will be available for the mid week copa affair. Lionel Messi is also carrying a thigh injury, but has already started training with the group. That means he could be more or less available for Sunday's match. In a season the other teams in Spain have weakened so much due to the exodus that we saw in the summer window, there won't be any other contender other than FC Barcelona and Real Madrid for the Liga crown. Incidentally both are being managed by new managers, we have to go back to the start of the Rijkaard era when both these teams had new managers. I have no idea how to put it better. The whole thing has to be a joke, otherwise we are all nuts! From the moment the referee blew the whistle at Allianz Arena in a humiliating 4-0 rout, we have been searching for a center back. Now they are saying that signing a center back in not a priority at all; the all blame is put on Tata Martino as he is reported to be not interested in signing a center-back. It looks like the fact that we even conceded against Malaysia in pre-season have no bearing in making that decision. You may ask why I am being so agitated! For the record, I wasn't too much in favour of signing a center-back this summer when the transfer window re-opened. I had my reasons for that - I expected Abidal to get back to fitness and believed in Muniesa and Bartra in providing sufficient cover. Including them we had Mascherano, Pique, Puyol(when he returns), Abidal, Bartra and Muniesa as cover for center-back position. That was more than enough. But the first thing the idiot named Rosell got to do in the transfer window was to ship Abidal and Muniesa out for free. And now he says we don’t have to buy a center-back! The whole thing is simply put Scandalous! If we seriously didn't have to buy a center-back, then why talk about Thiago Silva and David Luiz in each of your press conference. With barely a week left for the start of La Liga 2013-14 season, Barca is still clueless about the reinforcements needed for defense. Slowly Cules are gearing up to a brilliant possibility of seeing our defense stretched like a torn inner-wear, like in last season. Some of the similarities to last season have already shown up, with Puyol not available for the majority of the first half and Rosell & Co. arrogantly letting Abidal and Muniesa leave for free. No need to worry as such, as Rosell and Zubi will sign one of these guys - David Luiz (Chelsea), Jan Vertonghen (Tottenham) and Daniel Agger (Liverpool). Want to know the status of these three pursuits? It's simple, our first bid for David Luiz was firmly send back with a "Don't Waste Our Time" note attached; Agger's bid was also rejected but this time the note read "Not for that Money" and Vertonghen we haven't officially bid; strangely he is one player who was offered to Barca last season; we weren't interested and now we most probably have to deal with Daniel Levy. Now this preview has already started in a seriously negative way, isn’t it? Oh, Wait! There are more yet to come! Will Barca sign a Center-Back this summer? What should Barca fans read from the statement of their star center back? If there wasn't enough confusion already about Barca's strategy in the transfer market; this statement has compounded that feeling. All courtesy of the great work or the lack of it is done by Andoni Zubizarreta. If I say we are absolutely clueless about signing the center-back; that would be a glorious under-statement. For the record we can't blame the management for not signing the center back by now. We had or better put, they had dreams of signing first Thiago Silva, then Marquinhos , then David Luiz and now Daniel Agger; the list may not end there. So like the fans dreamt, the board and the Sporting director Zubizarreta also dreamt; incidentally it looks like he is paid to dream! Thanks to all this we are seriously looking at the prospect of seeing what happened last season repeat all over again. Does Andoni Zubizarreta deserve to remain Barca's Sporting Director? 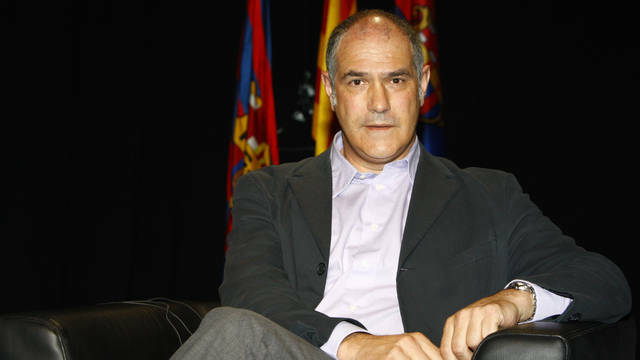 Andoni Zubizarreta, the legendary Spanish and FC Barcelona keeper was the choice of Sandro Rosell to head Barca's sporting area. The choice looked pretty reasonable at that time and was deemed to be a sure shot winner for Rosell. Andoni was doing a good job at Athletic Bilbao and his stature as a club legend would have only made it easy to pick him. But after 3 years as Sporting Director one needs to seriously question the wisdom of him continuing in such an important position. In order to go in detail to the issue surrounding Zubi, we first have to really understand what exactly a Sporting director's job is. A "Sporting Director”, more technically phrased "Director of Football" acts as a link between the Board and the Manager. The influence exerted by a Sporting Director varies very much depending on the country. For example in England the Sporting director will be in charge of looking the add-on functionalities in the footballing arena - like setting up facilities, running the academies etc. But the manager will have a bigger say in all other activities like transfers, contracts etc. But this does not hold true in La Liga. Here the manager is expected to focus solely on on-field performances and every other activity like transfers, contracts, performance appraisals, etc. are all done by Sporting director. That was the main reason why Mourinho got Valdano fired as he wasn't getting a say in a lot of club's football related activities. Both Lionel Messi and Neymar is expected to start and play along with each other in the Joan Gamper trophy match against Santos at Camp Nou tonight. 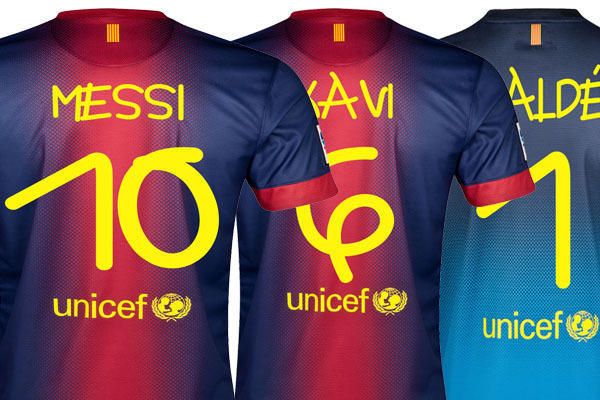 This match also will feature Barca players wearing special shirts with Anna Vives Font on it. The player's name and shirt number will be done in the Anna Vives font; whereas the shirt sponsorship done by Qatar Foundation and UNICEF will feature in usual font. 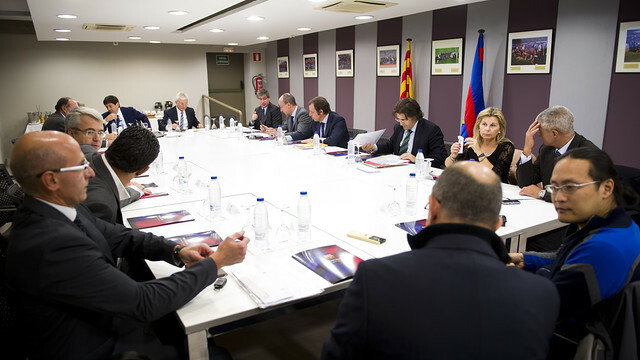 This is done as a result of an agreement between FCB foundation and Fundació Itinerarium. Anna Vives font is designed by Anna Vives, a girl with Down syndrome who has dedicated the year 2012 to approach the world of the letter, working on reading and writing. Andres Iniesta has been associated with this foundation earlier and will give away his shirt for auction after the match. He will also try to rope in as many of his colleagues to donate shirts, so that they could also be auctioned on eBay after the match. Jonathan Dos Santos made it Happen; He Stays at Barca! Perseverance is a big word. An online dictionary defines it as "steady persistence in a course of action, a purpose, a state, etc., especially in spite of difficulties, obstacles, or discouragement." or may be more philosophically as "continuance in a state of grace to the end, leading to eternal salvation.". You still didn't get it, then Look at Jonathan Dos Santos. Yes, the same guy who was told in unequivocal terms last season that he was a surplus to the requirement; one who was referred to by club management as the one who refuses to leave; one whom the then coach Tito Vilanova refused to look up as an option even when injuries were mounting; one who in many Barca fans' opinions was destroying his career by staying at the club against the club wishes; also one who was eating club's money and doing nothing! Oh, yes! I have heard that many times. To be honest Jonathan Dos Santos was not responsible for people arriving at conclusions about him. He wanted to succeed at the club and he wanted to do it on his own terms. So he stayed back, waiting for a call which never arrived; hoping for a chance which went to everyone else. 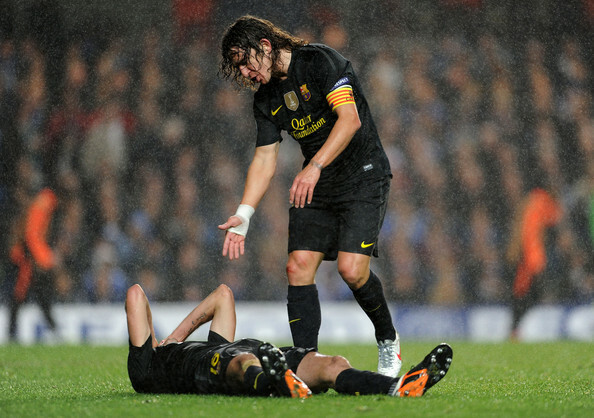 There were instances where Sergi Roberto made it into the squad but Jonathan stayed in the player's box. That was intended to send a firm message to him; he refused to accept. And now at the end, against all odds Jonathan Dos Santos stays. Jesus! it just happened.